We've all been the recipients of either no training, poor training, or maybe even the rare exceptional training. Have you noticed that no two trainings are ever given in the same way, even for the same task or process, resulting in quite different results from trainee to trainee? I'll admit it, in my years as an senior industrial engineer, training others in a variety of tools and methods from very simple to technical, I really didn't have the best know how on structuring and delivering those trainings. I did have professional help developing and delivering training for few teams I was on, but even then, the struggles with the training professionals were with what seemed like "their way" and not a standardized, documented, THE WAY to develop and deliver exceptional training. As an Industrial and Systems Engineer as well as a bit of a Philosopher, I know for certain that there are aspects of any job or task that are decomposable, standardize-able, improvable, and trainable, even seemingly highly creative jobs. I've recently dived into the world of deep process design and training development and this post is about sharing some of those insights with you. Back in my early years as an engineer at Boeing, I was sent to a Shingo Conference (one of the top tier Continuous Improvement and Business Excellence Conferences and Awards) to learn more about how other companies were applying Lean Manufacturing and other approaches to continuous improvement. The conference itself was packed with interesting case studies and "how to's". However, the single most interesting session that has made a lasting impact on me was with Lazy Boy (yay recliners!) and it's application of the Training Within Industry methodologies. Not only that, but they had applied an approach to job instruction, methods, relations, and programs to a non-traditional process most would consider not in the realm of manufacturing, and that is their Sales Process. They had applied a method designed for ramping up and training the entire US Industry for manufacturing products and materials to enable the critical success of the Allies in World War II, to a service process, and the seemingly wide open and non-standard Sales Process. They reaped huge rewards in doing so and were at the conference to share that lesson. Job Instruction - how to break down tasks to their fundamental elements and how to sequence those elements in effective training. Job Methods - how to break down tasks to restructure and improve them as well as how to effectively change the process in an organization. Why should you care? TWI essentially perfected training development and delivery and did so to enable training professionals within industry to train others (train the trainer), thus magnifying the effects of the program. They worked VERY closely with industry (and were staffed with many of the best training professionals) to perfect these methods for a delivery by anyone (certifications), to anyone (all types of learning abilities across a variety of different demographics), anywhere (in almost any business or manufacturing environment). Understanding the history, the scale, and degree to which they developed these methods is a tremendous case study itself but shows that these people PERFECTED it. Someone might say "Well....that was 70 years ago, that can't be relevant!"! Anyone saying that has no clue about how long it takes our brains, as a species, to change enough such that these perfected methods would be rendered inneffective. That's a fancy way of saying these methods are timeless. Dinero's book speaks to that and the very small changes that have been made, mostly in updating to modern language and gender sensitive language. These methods are truly timeless and boundless in their application. These methods are applicable to startups, solo entrepreneurs, and growing small businesses like they would be to any other business environment. I think TWI and its method are even MORE critical today than ever before for these types of businesses. The US economy is booming and is in a "labor shortage" or "skills shortage" stage in across many critical industries like aerospace and construction. I hear from my clients as well as other business owners that they "just can't find good employees". I understand that pain but often these businesses lack a truly robust approach to training new employees in an effective and efficient way. Not only that, but they also lack a standard approach for improving their job methods as well as a systematic approach to job/employee relations. TWI provides simple, repeatable methods for achieving the goal of rapid productivity improvements, rapid onboarding of new employees, and effective people relations and resolutions. This is while avoiding the downsides of high turnover, low employee morale, stress and strain for owners AND employees, and one of the primary results is poor productivity and in some cases, business failure because of the impacts of these issues. I've also found familiarity with these methods VERY usueful as a parent. While I'm not applying TWI methods with the full rigor of the program, understanding the simple methods and approaches are helping me to set better expectations for myself and my kids and vastly improved methods for training when I'm helping them develop new skills. I'm seeing positive results for all of us when I have a simple protocol to follow! It's freed space for me and the kids to enjoy our experiences working and learning together rather than battling over my poor delivery and their unique learning styles. 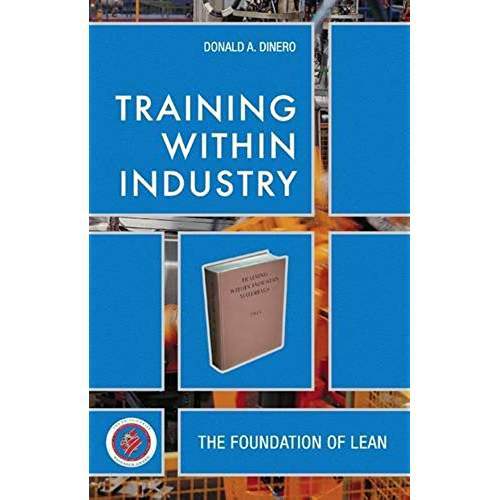 As with many origins of continuous improvement and industry excellence from the past 100 years, many people and organizations have no awareness of TWI and how it was one of the MAJOR origins for Lean Manufacturing, the Toyota Production System, Six Sigma, and much more not to mention critical to the Allies winning World War II. I wrote this post do to my part to spread more awareness of this incredibly powerful and timeless methodology as well as its importance to our nations history. As always, let me know if you have feedback or comments in the comments section!